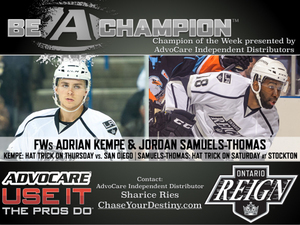 Forwards Adrian Kempe and Jordan Samuels-Thomas each recorded hat tricks last week as the Ontario Reign pocketed victories over the San Diego Gulls and Stockton Heat for a week record of 2-0-0-0 and improved their overall record to 7-1-2-0 to reclaim the top spot in the Pacific Division. On Thursday, the Reign hosted the Gulls at Citizens Business Bank Arena for the first meeting of the year. 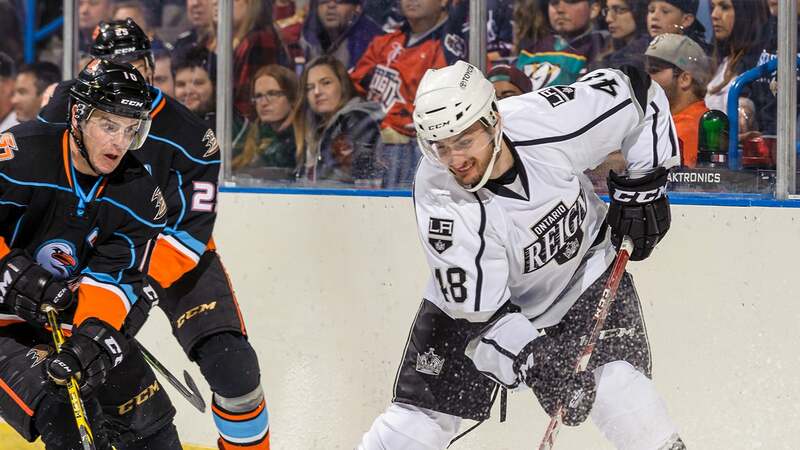 Reign forward Michael Mersch opened the scoring in the first period before Kempe took over in the second frame, lighting the lamp three times to propel the Reign to a 4-1 victory. Goaltender Peter Budajpicked up the win making 20 saves. Budaj and Samuels-Thomas took center stage Saturday night at Stockton Arena in Stockton, California with Samuels-Thomas earning his first three goals of the season and Budaj grabbing his league-leading fourth shutout with 38 saves in a 4-0 triumph over the Heat. Forward Sean Backman scored a power-play goal, his first tally of the season, and leads the Reign with six power-play points (one goal, five assists). Forward Sean Backman is tied for second in the American Hockey League with five power-play assists. Forward Ryan Horvat is tied for fourth in the AHL with three major penalties. Forward Michael Mersch leads the AHL with 49 shots. Goaltender Peter Budaj is first in the league with a 1.31 goals-against average (GAA), .947 save percentage and four shutouts. He is tied for first with seven wins. Forward Valentin Zykov is tied for first among AHL rookies with two game-winning goals. Forward Adrian Kempe is tied for ninth among first-year players with eight points (four goals, four assists).